Reamer Shoe is designed specifically to be installed on Casing or Liner and Screen where operators have concerns about potentially difficult wellbore conditions such as, swelling shale's, ledges and washed out areas of wellbore, post drilling and prior to running casing. The aluminum eccentric guide nose climbs ledges and negotiates obstructions while the cutting structure reams out tight spots or obstruction in the wellbore. Compatible with all casing and liner hanger assemblies, our Reamer Shoe provides highly effective protection- against unexpected or anticipated casing and liner running problems, and has been specifically designed for potentially difficult wellbore conditions such as swelling shales, ledges and washed out areas of wellbore. The high strength profiled alloy nose will anchor even in uncured cement to facilitate ease of drill out. 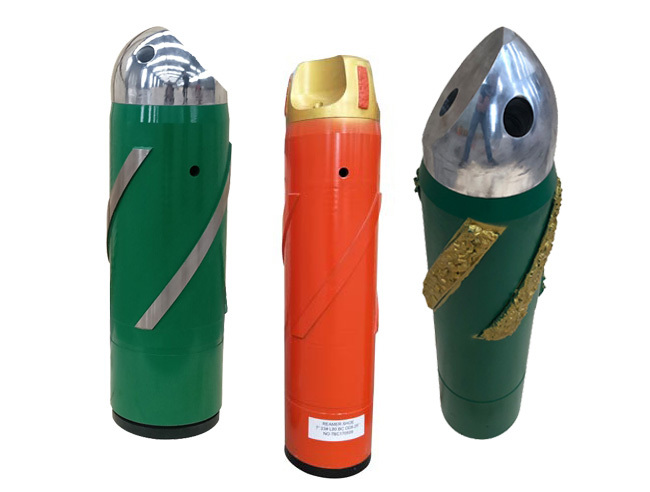 The aluminum eccentric nose is easily drilled with both PDC and Rock bits. The chip breaker holes in the nose assembly are designed to create small aluminum chips to avoid “bird nesting” on the bit. Benefits to customers include improved drill out times without compromising the reaming capabilities, a reduction in NPT and increased opportunities to reach TD.